This drink has changed my life this summer. Charlotte was in the middle of an historic heat wave in June and I was craving something refreshing yet caffeinated to help me power through my day. This dairy-free, iced dirty chai recipe was just the answer. For years, I have sporadically heard people ordering a dirty chai at coffee shops but never really felt the urge to figure out what the heck they were talking about. This year, doing the whole dairy-free thing to keep Baby K a little happier, I have been searching for tasty creative vegan alternatives to my traditional iced coffee drinks. This vegan iced dirty chai definitely does the trick. Chai tea plus strong coffee or espresso plus almond or soy milk. Over ice. Done. Being the rebel mom that I am, I even made a less-coffee version of these for my kids while I let them stay up late watching the NBA Finals… or as my 7 year old called it, the Cleveland – Georgia State game. It was too cute to correct her. You can definitely make all the parts of this tasty drink yourself … make some homemade almond or cashew milk, make your own chai tea, make the espresso or strong coffee – OR you can buy the almond milk (or soy milk) and the chai tea latte concentrate (a container is about $4 at my grocery store) and just make the coffee. Easy peasy. For this batch of Iced Dirty Chai, I used store-bought coconut-almond milk and store-bought chai tea latte – it was super tasty and quick and dirty – just like the name. 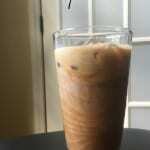 This dairy-free iced dirty chai recipe is a perfect pick-me-up for a hot summer day. 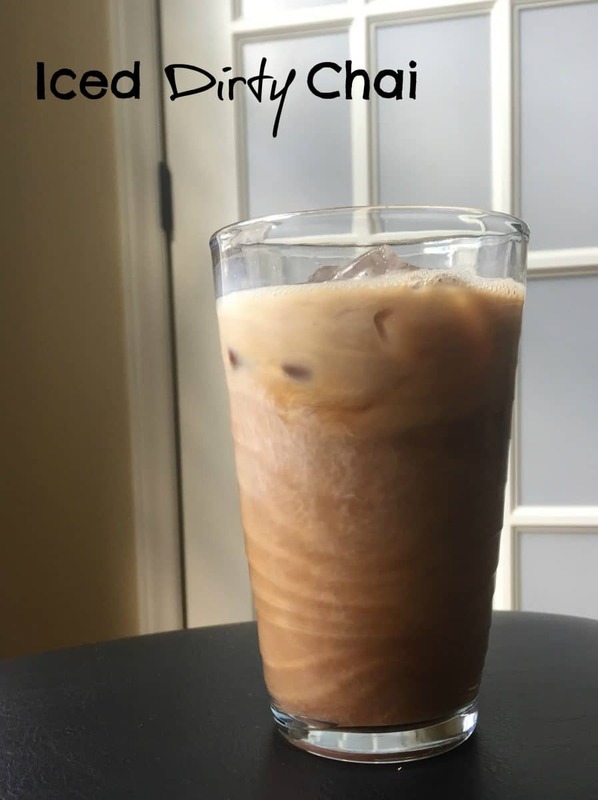 In a tall glass filled halfway with ice, pour 1/2 cup of chai tea latte, 1/4 cup of cold dark coffee, and 1/2 cup of your favorite dairy-free milk. Enjoy! I’ve grown to actually like chai! The first time I tried the spice combo I wasn’t a fan, but now I’m liking it more and more! Wonderful! Chai had to grow on me as well! I am a coffee girl at heart. 😉 This combo is heavenly. I’ve never been a huge chai fan even though I adore almost all other teas. I bet mixing it with coffee makes it delicious though! I’ll try this soon. Mixing it with coffee totally changes the flavor! I can’t believe I never tried it before. Very refreshing – not too sweet. This is my kind of morning drink in the summer! I love a good chai like this. I am going to try this one out. I like cold drinks in the summer over hot! Thanks, Julia! Cold drinks on hot summer mornings are the best. Oh YES! I recently fell in love w iced dirty chai’s and haven’t looked back, calories be damned! 😉 Gotta try making my own!! Erin…this is super interesting….first I am hearing of it and definitely need to try it! I can’t believe it took me this long to discover this drink since I LOVE anything involving coffee. Hope you like it! I have been drinking dirty chai my whole life and had no idea! What an awesome recipe. I have never tried putting ice in my chai tea so this will be so much fun. Ha! That is funny! Definitely try it iced.